The CBS series with a U.S. modern slant to the Sir Arthur Conan Doyle detective Sherlock Holmes and his partner in solving crime Dr. Watson, Elementary stars Lucy Liu and Jonny Lee Miller as the two literary legends from England. The timing of the network’s creation did alarm the BBC who have their own present day version of Holmes. The U.K. series, which is really more like a collection of three to four 88 minute TV movies broadcast yearly is based more on the books. This version made Cumberbatch a star, or at the very least a household name, and the British were concerned that their show, developed in 2010 had been copied in the 2012 American version. In high school there wasn’t a chance to take world history and despite my fascination about all things English, if it didn’t appear in a Sherlock Holmes book, I didn’t know about it. I moved to England on the 5th of July 1982. I lived on the air base until September that year. I finally got permission to move off base after they realised that I was getting to stay in the base dormitories for free. As I was divorced my money towards housing –which went straight to my divorced wife and baby– could not be taken in exchange for my room. I’m pretty sure that the base housing folks were glad to see the back of me. I had just gotten over the shock of realising that English kids didn’t know about Halloween, or at least very much about it, and hadn’t learned about trick or treating to a great extent. I hasten to add that has changed, although they still aren’t as dedicated to it as American kids are. I asked in the pub why the kids were asking for a penny for the guy. I then learned about Guy Fawkes night and the celebration of it. Guy Fawkes was the man who decided it would be a jolly good idea to blow up the Houses of Parliament way back in 1605. Now Fawkes was not alone in this dastardly deed. 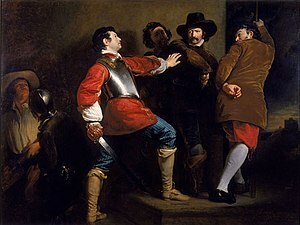 He was part of a group of zealous men whose assassination attempt became known as the Gunpowder Plot. The entire plot was uncovered and foiled by the authorities. Guy Fawkes –as well as many of his zealous friends– was hung for his troubles. I don’t know when Guy Fawkes night, or bonfire night as it’s more popularly known, began but there is a little dittie that was sung back in 1742 about the whole escapade. All I do know is that on the 5th of November they used to burn poor old Guy Fawkes in effigy on a huge bonfire. This was generally accompanied by fireworks. 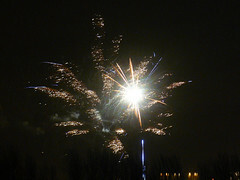 Each village would, and still does, build a huge bonfire and set off fireworks as part of the celebration. Children would make up their straw representations of Guy Fawkes and beg for coppers (pennies) to buy fireworks with. This custom has sort of died out over the years. 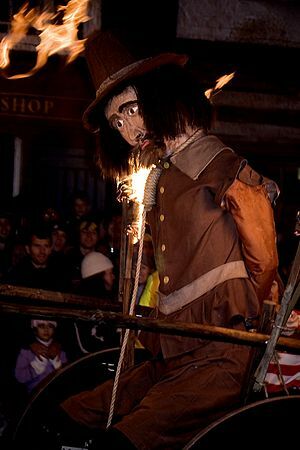 I haven’t seen a “Guy” on a bonfire for years and I definitely haven’t seen children making the effigy of him to be burned. Each year though villages, towns, and cities across the country hold celebrations that include bonfires, fireworks and stalls selling food. The smaller the village the smaller the celebrations. Ipswich holds a grand fireworks display and a bonfire of epic proportions each year, usually on the first weekend nearest the actual date. As I set here at home and listen to the fireworks being shot off all around me, I can’t help but wonder where the actual traditional tone went and what the future will be for Guy Fawkes day. It seems to me to have lost a lot of it’s original meaning when they dispensed with the burning of the effigy. It just seems like another “official” reason to set off bangers (firecrackers) and skyrockets. I suppose that setting them off for New Years just isn’t enough. Author Mike's Film TalkPosted on November 3, 2012 Categories Blog, EntertainmentTags England, entertainment, Fireworks, Gunpowder Plot, Guy Fawkes, Guy Fawkes Night, November, Sherlock Holmes, Westminster Palace14 Comments on A Penny for the Guy?